Last March 26th was not only the 188th anniversary of Beethoven’s death but also the 90th birthday of that most influential of 20th-century musicians, Pierre Boulez. Like Elliott Carter or Milton Babbitt, longevity mixed with unparalleled stature (though one that is of course far from uncontested by those anxious to wake up from musical modernism as from a bad dream) has meant that several earlier birthdays have already been celebrated (in particular the 60th and 75th) with a myriad of musical and scholarly manifestations including concerts, recordings, and publications. Sadly, the maestro’s failing health has prevented him from attending most of these events, including, alarmingly, a festival of his music in Baden-Baden, which he has called home since the late 1950s. Highlights leading up to the birthday celebrations include the 2013 Deutsche Grammophon release of the composer’s “Complete Works” on 13 CDs. 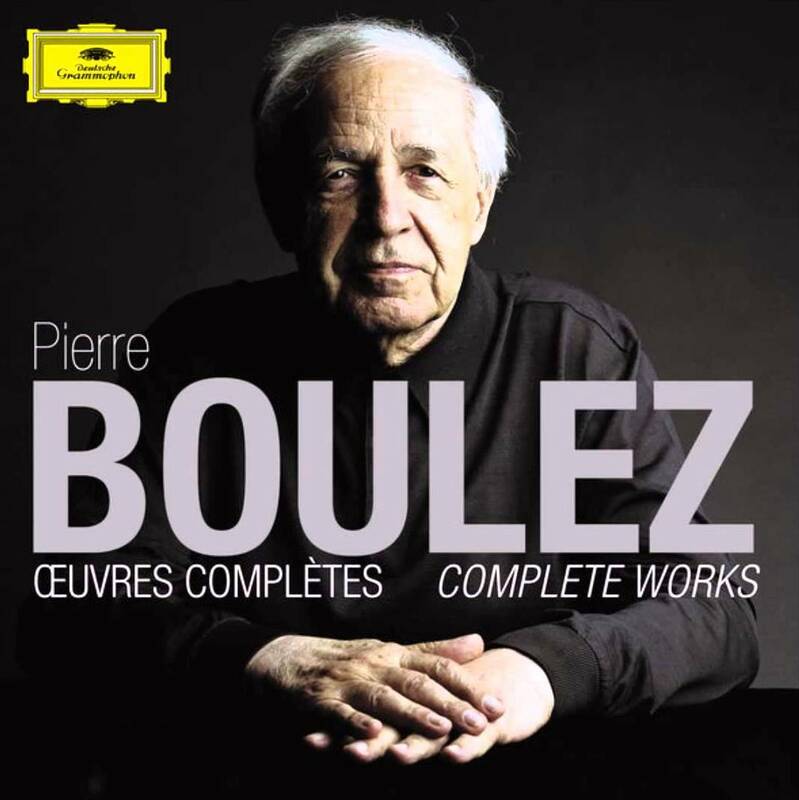 The title of the box set is doubly unexpected, since it seems both to acknowledge that no additions to the Boulezian catalogue will be forthcoming and also to fly in the face of the composer’s Joycean aesthetics of incompleteness that has meant that many of his works exist in multiple versions, often fashioned over the span of decades. Fittingly, the two U.S. symphony orchestras with which he is most closely associated, Cleveland and Chicago, have celebrated his music in high-profile concerts, the latter even producing a multimedia film/concert in collaboration with the architect Frank Gehry, premiered on 14 November 2014, entitled “A Pierre Dream: A Portrait of Pierre Boulez.” A Paris exhibition on Boulez’s life and music took place at the Musée de la Musique and at the brand new Philharmonie de Paris, both located at the Cité de la Musique, the musical complex in La Villette in the outskirts of Paris that was Boulez’s brainchild, accompanied by a handsome catalogue (ed. Sarah Bernadette) to which I was happy to contribute. In London, where Boulez once conducted the BBC Symphony Orchestra, that orchestra as well as the London Symphony Orchestra, together with the new music-outfit that Boulez founded, the Ensemble Intercontemporain, offered a Boulez “Total Immersion Day” at the Barbican. There is no better postwar piece written for orchestra than Notations, his five hyper-elaborate orchestral canvases, all based on very simple serial pieces he wrote for the piano in his early 20s. Arguably the most important composer-conductor since Mahler, Boulez knows the orchestra more intimately than any of his colleagues, and these short, dazzling showpieces have an intoxicating exuberance and elegance. (George Benjamin, “In Praise of Pierre Boulez at 90,” The Guardian, 20 March 2015). It’s also too bad that the Notations score is too tall to lend itself to convenient study in the classroom. Still, something needs to be done about the monopoly that the rather uncharacteristically arid Structure 1a from the first book of Structures pour deux pianos (1951–52) continues to enjoy in 20th-century music theory classes in North American universities. Perhaps instructors should consider presenting the more sensuous (if less radical—to paraphrase the title of an NPR radio documentary on Boulez produced by Tom Huizenga last March) chamber works like Dérives 1 (1984) or Mémoriale (...explosante-fixe...Originel) (1985), not to mention the many teachable moments available in certain movements of the truly seminal Le Marteau sans maître (1952–55). The last ten years have also been rich in scholarship on Boulez. New approaches to research on Boulez have been offered by Catherine Steinegger, who published a book-length study of Boulez’s work in the theatre (Pierre Boulez et le théâtre: de la Compagnie Renaud‑Barrault à Patrice Chéreau, Brussels: Mardaga, 2012); and Edward Campbell (Boulez, Music and Philosophy, Cambridge UP, 2010), who takes seriously the philosophical sources of Boulez musical thought. The last few years have also seen new discoveries on the analytical front (by such theorists as Catherine Losada and Ciro Scotto), and most of all, a flurry of sketch studies made possible by the establishment of the Boulez Fund at the Paul Sacher Foundation (Fonds Boulez, Fondation Paul Sacher) in Basel in 1986, that despite the sometimes forbidding nature of the technical and philological apparatus used, constitutes a major breakthrough in Boulez studies (including pioneering work by Robert Piencikowski, Pascal Decroupet, Peter O’Hagan, and Paolo Dal Molin). The Sacher Foundation has so far produced two beautiful (and giant) facsimile editions of Boulez’s works, Le Marteau sans maître (ed. Pascal Decroupet, London: Schott, 2005) and Tombeau, the last movement of Pli selon pli (ed. Robert Piencikowski, Universal Edition, 2010). I hope that more are on their way. All of these are welcome additions to scholarship on the composer that is already indescribably vast: a bibliography of writings on Boulez that spanned sixteen dense journal pages was published as far back as 1972! (Michael Fink, “Pierre Boulez: a Selective Bibliography,” Current Musicology 13, 1972: 135–50). And that was the year that Boulez was named principal conductor of both the New York Philharmonic and the BBC Symphony and the point at which scholarly (and general) interest in his music really began to gather steam. I’ll be publishing a detailed annotated bibliography of writings on Boulez in Oxford Bibliographies, which I had to painfully prune down to the bare minimum of sources (some 150-odd), since it is likely that no composer from the postwar period has been the subject of so many articles, interviews and journalistic pieces, not to mention the many book-length scholarly publications on Pierre Boulez, the first dating all the way back to Antoine Goléa’s Rencontres avec Boulez (Paris: Julliard, 1958). And yet, seen from another angle, it almost seems as if scholarship on Boulez and his contemporaries were just getting under way. The tempering of the influence of hard-boiled modernism on historiography in the last two decades has made room for scholarship that might not have been possible in the era when the musicology of the postwar avant-garde was spellbound by these composers’ own hyper-confident discourse, already unquestionably infused with historiographic raw materials, as Charles Wilson (“György Ligeti and the Rhetoric of Autonomy,” Twentieth-Century Music 1/1, 2004: 5–28) and Anne-Sylvie Barthel-Calvet (in her introduction to Propositions pour une historiographie critique de la création musicale après 1945, Metz, 2011) have both noted. Some recent scholarship offers historiographic narratives that diverge considerably from those suggested by the composer’s own pronouncements. Georgina Born’s classic Rationalizing Culture (University of California Press, 1995), with its sociological methods, certainly deserves to be mentioned in this regard, as does Mark Carroll’s study of Boulez’s Structures in the context of that famous Cold-War era cultural showdown, the 1954 “Oeuvre du 20e Siècle” organized in Paris by the Congress for Cultural Freedom (Music and Ideology in Cold War Europe, Cambridge UP, 2006) or an article by Ben Parsons that parses the political and social context of Boulez’s writings from the 1950s (“Sets and the City: Serial Analysis, Parisian Reception, and Pierre Boulez’s Structures 1a,” Current Musicology 76, 2003: 53–79). In my own work, I have lately become interested in the relationship of modernist composers of Boulez’s generation with the sound technology of their era. This is particularly striking in Boulez’s 1958 orchestral work Doubles, later expanded into Figures Doubles Prismes. Its most obvious feature is its use of an unusual seating plan, in which the orchestral choirs are divided into several groups and scattered across the stage; it shares this interest in orchestral space with Stockhausen’s Gruppen, a work that was premiered barely a week after Doubles. I was interested in viewing Doubles as a product of its times, one of the important technological developments of which for music concerns sound recording and reproduction, specifically the commercial introduction of stereo long-playing records that led to the mass-distribution of stereo sound technology into homes throughout the western world. This led me to wonder whether an allusion to the technology of stereophony might have been inscribed into Doubles and whether contemporary concert-goers might have heard it in relation to this new cutting-edge audio technology. I developed this hypothesis on the basis of the seating plan of the work, and of the title that might have been in part an allusion to the two-tracks of stereo and to the coincidence that stereo LPs were introduced into the commercial market in the same year as the work’s premiere. I was gratified when I finally dug up the program note from the work’s Parisian premiere to find that Boulez claimed there that “no one will contradict me when I claim that the ear in our time requires stereophony in its desire for clarity and movement.” Later, with successive performances of new versions of the work throughout the 1960s, Boulez either downplays the association with stereophony (Boulez would write in the interview published in the program of a 1965 performance in Cleveland that “there is no aiming for spectacular effects of the ‘tennis’ or ‘ping-pong’ type; rather a structural disposition of the orchestra which allows what in physics is called ‘Brownian movements’ ”) or omits it altogether. I go on to try to analyze this shift in terms of the ambiguous relationship modernist composers have with technology. This is the subject of a chapter I will be contributing to an upcoming volume: Boulez Studies, ed. Edward Campbell and Peter O’Hagan, forthcoming from Cambridge UP. Jonathan Goldman is Associate Professor of Musicology at the Université de Montréal (website HERE). He is the author of The Musical Language of Pierre Boulez. 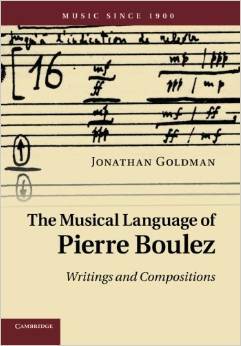 Writings and Compositions (Cambridge UP 2011), editor of the volume La Création musicale au Québec (Collection PUM, 2014), and co-editor of the volume La Pensée de Pierre Boulez à travers ses écrits (Sampzon, Delatour France, 2010). He is also editor-in-chief of the journal Circuit, musiques contemporaines. Certain aspects claiming the right ideas. I recently defended a master thesis on the texture in Boulez Work. I tried to contact Prof. Dr. Goldman, he is of course in my bibliography , but he ignored me completely, perhaps because my research was made in Brazil, not considered Western culture for the North epistemology. I just checked my archived mailbox, and found no such email. Perhaps it got lost or was sent to the wrong email address. Or maybe I did indeed fail to answer it, as can happen to anyone, even with the best of intentions. In any case, I think it is very unadvisable to impute prejudice to someone purely on the basis of un unanswered email. All the best with your research, Jonathan Goldman.